Pico Way is the most advanced approach to treat Melasma and Tattoo Removal currently available in the market. Unlike conventional laser that breaks Pigments in to smaller size, Pico Way breaks Pigments in to dust sized particles. With this revolutionary laser technology, we can treat almost all Tattoos and Skin Pigmentation in a very safe and effective way. What Results Can Pico Way Bring? Pico Way is known for being the most powerful Tattoo Removal treatment in the world. It can eliminate most colors effectively with least scarring and downtime. However, in Korea, Pico Way is most often used for treating Pigment and Skin Rejuvenation. It works on the skin texture by smoothing out fine lines and reducing pore size. Before the invention of pico second lasers, the trend was to use the 1064 Q-Switch ND YAG Lasers at low fluency to perform laser toning. Now we can see the new laser toning technique with 1064 wavelength in Pico Way. This gives improved and faster onset of results, while being highly efficacious in treating acne scars. With Pico Way, patients with acne scars feel their scars become less noticeable. Now they do not need to go through the painful and troublesome procedures from the traditional acne scar laser treatments. How Soon can Patients expect results? What many patient love about Pico Way is that they can see improvement in about one week after with almost no downtime. However, patients must know that downtime can vary with different treatment techniques. Pico Way laser has the shortest pulse duration amongst all the Pico Second Laser today. It delivers energy precisely with least collateral damage to the skin. Therefore, it is the most ideal laser treatment for Asian skins, where Skin Pigmentary Lesions can often be challenging to treat due to possible laser induced hyper pigmentation. Target Patient for Pico Way? Almost all patients with pigmentation conditions including Melasma and abnormal Ota’s Nevus can benefit from Pico Way. Patients with acne scars, enlarged pores and fine wrinkles also see visible improvements with Pico Way treatment after just 1-3 sessions. 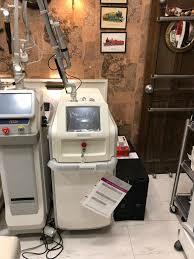 To read more about Pico Way and other state-of-the-art skin care technology available at Dr Ikram Ullah Khan’s clinic, please go to our page LATEST MACHINES.